Tubes of varying lengths are accommodated by the telescoping lids of these boxes. made of polypropylene, they can be used for freezer storage and autoclaved. Lids are alphanumerically labeled. Boxes hold 0,5 ml, 1,5/2,0 ml and 5 ml tubes as well as cryovials and chromatography vials. 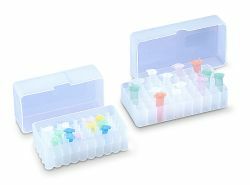 Freezer storage racks and numeric ID grids are available for the 1,5/2,0 ml boxes.